This Antipasto Tray is the perfect addition to any potluck. The five different recipes create a delicious antipasto tray, with something for everyone. SIMMER 4 cups finely chopped crisp vegetables such as cauliflower, onion, carrots, celery, peppers and mushrooms in 1 bottle Kraft Classics Catalina Dressing for 15 minutes. Toss in a few sliced black olives and you've got a great chutney. Serve chutney with sliced bread and crackers. COMBINE 1/2 cup Miracle Whip Original Spread with a spoonful of pesto. Serve with cooked tortellini on skewers. CUT 1 pkg (250 g) Philadelphia Cream Cheese on a diagonal and place the outer edges together to form a triangle. Top with chopped sundried tomatoes and fresh basil. CUT Kraft Mozzarella Cheese into bitesize cubes and marinate in Kraft Signature Sundried Tomato & Oregano Dressing. 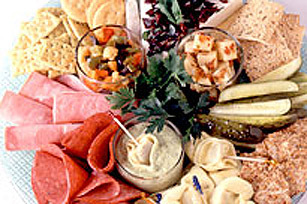 INCLUDE a variety of deli sliced meats and Claussen Kosher Dill Pickle Halves.